Synchronizer gears form the transition between gearwheel and shift collar. Through friction, they bring both wheels of the required gear to the same rotational speed, so that this can be engaged without declutching. During the gear shifting, the shift collar is pushed to the gearwheel. In the process, the locking piece pushes the synchronizer ring onto the conical part of the gearwheel. Through the friction of the synchronizer ring, the gearwheel is accelerated or decelerated. The synchronizer ring is supported over the lugs on the shifting body. Due to the play in the lugs on the shifting body, the synchronizer ring is repositioned by about a half a tooth width and thus blocks the shift collar’s way into the gap in the teeth of the gearwheel. Once the synchronization is established, there is no longer radial force acting on the synchronizer ring. Due to the chamfering on the end faces of the shift collar and synchronizing ring, the synchronizer ring is turned back. The tooth spaces become free and the shift collar can be slid over the teeth. The gear is engaged. Quiet synchronization is guaranteed by precisely coordinated gear teeth. The synchronizer rings are forged. This production method ensures a more consistent tooth form with high strength. The friction surfaces of the synchronizer rings are coated with Molybdenum. This protective layer is characterized by excellent frictional properties and guarantees minimum wear during the synchronization. 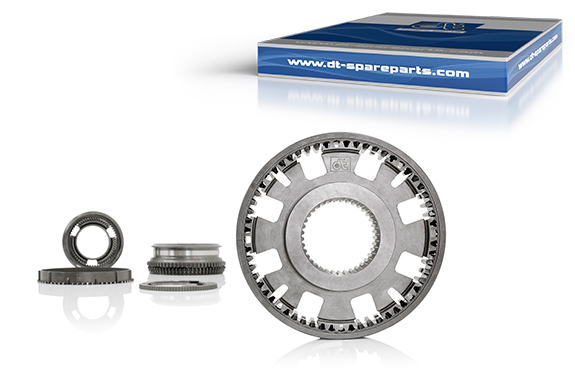 In addition to synchronizer rings, DT® Spare Parts also offers all standard gearbox parts.